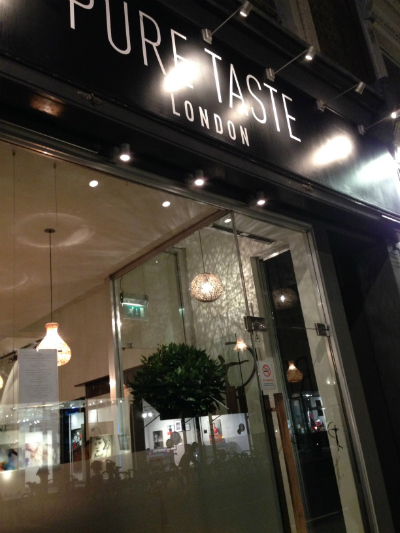 Yesterday marked the beginning of an exciting new restaurant in London. 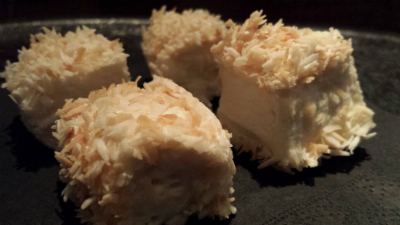 A Paleolithic restaurant that is 100 % gluten free . The brain child of this exciting project is Holly Redman a nutritional therapist and chef who started her dream with a pop up restaurant in Sussex . 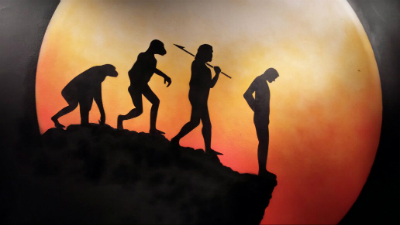 Due to its success Holly decided to take the brave step of searching for a property in London near good transport links where she could bring this paleo fine dining experience to more people. Many of us have been watching with great interest and excitement about this venture, so much so that we invested in her Kickstarter appeal and as part of that we were offered a launch meal for two when the restaurant opened. Well that day finally came yesterday when the doors of Pure Taste opened to the Kickstarter backers for the very first time. A party to celebrate this exciting project coming to reality for Holly and her team. Now they say location, location , location and this restaurant is really in the perfect position on Westbourne Grove. 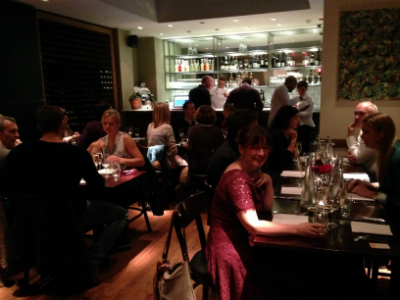 Amongst restaurants and some lovely shops an easy walk from Notting hill gate tube station. A small ( from the outside ) restaurant opening up to a large dining area further back and a bar and then further seating downstairs. The large window looks through to smart lighting and small tables and beautiful art work and Pure Taste lettering on the wall as you enter. For our evening the room was arranged with two oblong tables and one circular one making for a social dining experience. My guest for the evening was my dear friend Liz who kindly joined me, as my husband was away on business. Liz is following a low carb high fat diet and avoids gluten and strives to eat healthily avoiding refined sugar too, making her the perfect plus one. We were offered a glass of bubbly and chose seats near to the live music that would accompany our evening. A duo of spanish guitar and singer followed by a lady with a beautiful voice on guitar. We were first served a canapé at the table. 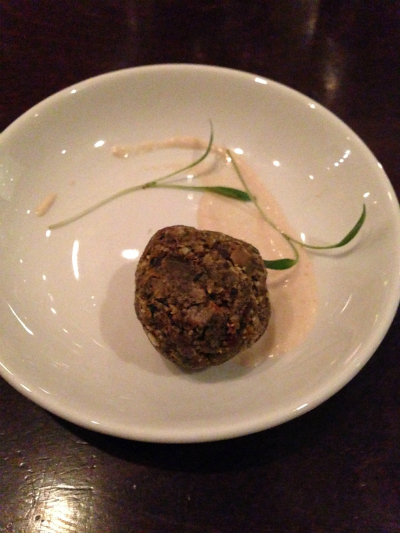 I had chosen the pumpkin falafel with tahini and lemon dressing. It was full of flavour and I could definitely of eaten quite a few of these! 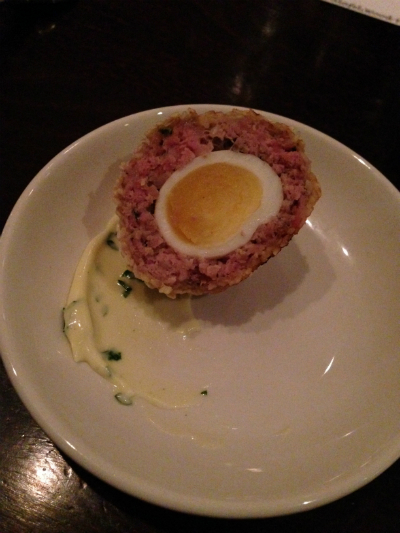 Liz opted for the canapé quail scotch egg which she said was delicious. Next a pre starter an individual beetroot ‘raviloi’ with tarragon cashew cheese, yellow pepper sauce and pistachios served on a tiny plate. Again the flavours were sensational We had actually forgotten what was in this dish so we asked our waiter if he could go through the ingredients. Something I think is a nice touch at a fine dining restaurant. 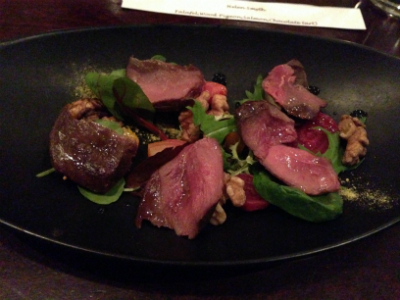 For my starter I chose the pan fried wood pigeon breast with roasted beetroot, walnut and watercress. Probably something I wouldn’t normally chose on a menu but very glad I did. well presented and seasoned a lovely dish. 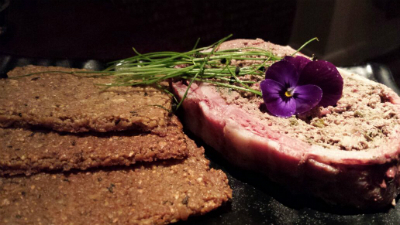 Liz chose the chicken liver and bacon terrine, with rosemary plantain crackers and seasonal leaves. I have to say I was a wee bit jealous of this stunning starter. Unfortunately it contained chives and I wasn’t sure how I would react with them so avoided. I did however ask it I could try a rosemary plantain cracker and generously a tray of them came straight out to our table. Liz loved her starter, possibly her favourite course I think served with a glass of red wine it did look good! 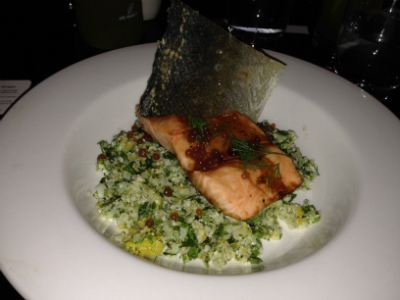 My main course I had pre ordered the oven roasted Loch Duart salmon with orange and coriander cauliflower pilaf. Mine came without the onion and garlic, I instead had an extra burst of fresh herbs, I added a little extra pink himalayan salt and pepper to mine which I felt it needed but otherwise the salmon was cooked to perfection and it was a very pretty plate of food. 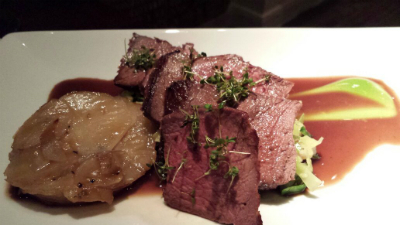 Liz chose the canon of venison, brussels sprouts with bacon and boulangère jerusalem artichokes and a red wine jus. This looked very good and I hear tasted very good too. For pre dessert everyone was given a small shot glass of mulled wine sorbet, there was mixed opinion on our table but Liz enjoyed her and said it was like Christmas in a glass. 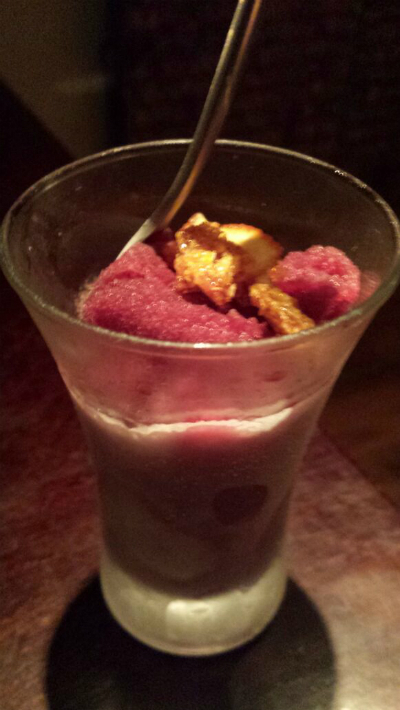 Sadly due to the wine content I could try the sorbet. For a while I was forgotten but eventually some delicious marshmallows covered in toasted almonds were brought out for me, which I was able to share with my guest. I wasn’t blown away by the taste of these but the texture was very good and to have a different type of treat was nice, although I would have preferred a sorbet. Dessert always for me anyway is a disappointment when eating out as usually only offered a fruit platter and occasionally a fruit sorbet. 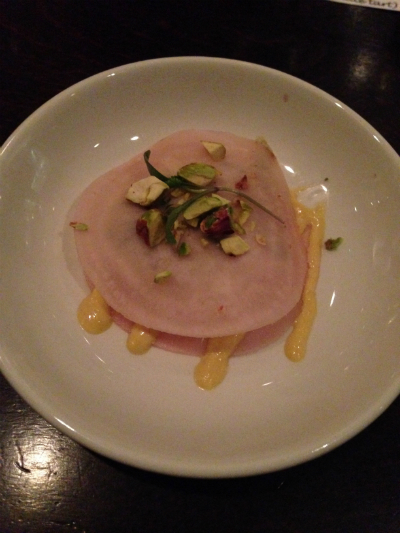 Gluten free puddings in restaurants are almost non existent . But Not here! There was a choice of Chocolate tart with cacao nibs and goji berries and caramelised banana ice cream and dark chocolate lattice all dairy and gluten free of course. It doesn’t get much better than that. 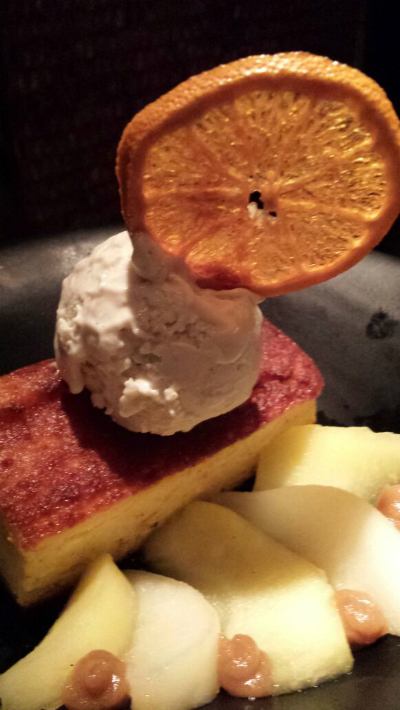 Also Clementine and almond cake warm winter fruit salad and vanilla cashew nut ice cream. Again gluten and dairy free. 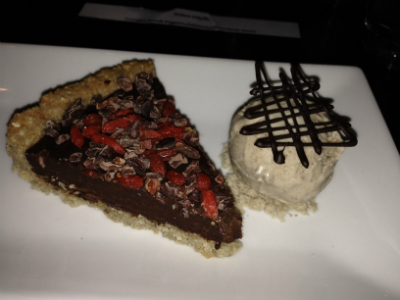 Both desserts were well presented, I opted for the chocolate tart and so we could try both Liz chose the cake. Neither of us were disappointed . Both preferring our own choice and both agreeing that the size of the portion was just too big for a fine dining experience. Seams a strange thing to say I mean who doesn’t want a large slice of chocolate tart ! It just was not balanced with the rest of the meal. Notwithstanding this the desserts were delicious and possibly one the best dessert I have eaten in a restaurant since being gluten free. 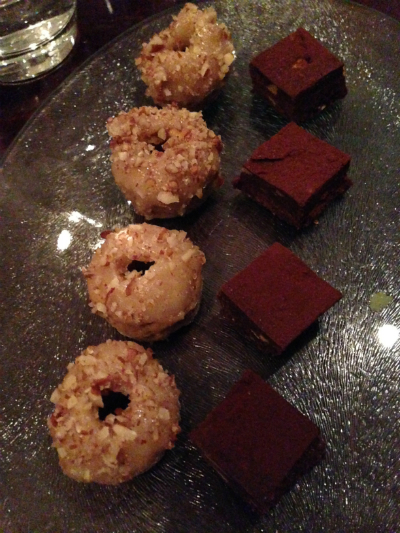 The meal finished with a plate of petit fours to share, little squares of hazelnut chocolate fudge and wait for it! Maple glazed donuts, yes really tiny bite sized treats which were delicious. If only I hadn’t eaten all that chocolate tart I may of had room for more than one. These were served with coffee or tea dairy free milk of course. The evening was a great success, I’m sure a real learning experience for the waiting staff . I look forward to booking up again in a few months when the restaurant has been open for a while . The menu I hear will constantly change ever couple of months with seasonal choices and new creations from Holly I’m sure. A big thank you especially to Sharon who made us both feel very welcome and made sure my food intolerance’s were past on to Holly. Congratulation Holly on making your dream a reality the food was delicious and inventive and I look forward to future visits to your Paleo fine dining restaurant. Thank you for the extra effort you went to with my meal it was much appreciated. 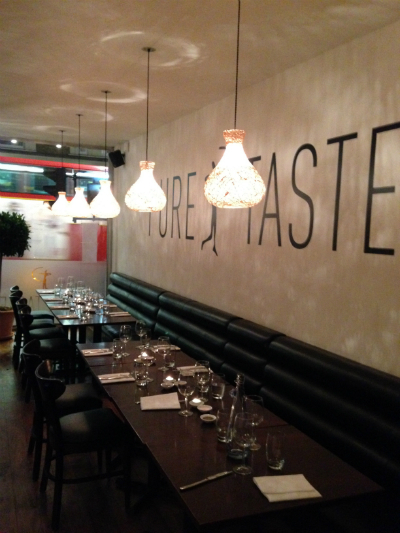 If you live in London or can come down for a visit why not book up to eat at Pure Taste restaurant and see and taste for yourself this exciting and delicious food. A fine dining experience for everyone!